The conclusion to the epic trilogy that stretches from the earliest voyages of the StarshipEnterpriseto Captain Kirk's historic five-year-mission-and from one universe to another-just in time for the milestone 50th anniversary ofStar Trek: The Original Series!Eighteen years ago, the StarshipEnterprisethwarted an alien invasion from another universe, and Captain Robert April took possession of the interdimensional transfer device that made it possible. 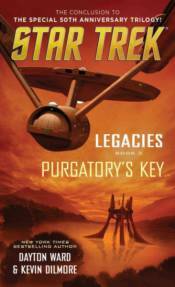 Since then, each captain of theEnterprise,from Christopher Pike to James T. Kirk, has guarded this secret with his life.Now, Romulan agents have succeeded in stealing the device and using it to banish Ambassador Sarek and Councillor Gorkon to an unknown realm in the midst of their groundbreaking Federation-Klingon peace negotiations. With time running out as interstellar war looms in one universe-and alien forces marshal in another-will Captain Kirk and his crew preserve the tenuous peace and reclaim the key between the dimensions?, �, & � 2016 CBS Studios, Inc. STAR TREK and related marks and logos are trademarks of CBS Studios, Inc. All Rights Reserved. About the AuthorsDayton Ward is the New York Times bestselling author of the science fiction novels The Last World War, Counterstrike: The Last World War�Book II,and The Genesis Protocol,and the Star Trek novels Legacies: Purgatory�s Key, Elusive Salvation, Armageddon�s Arrow, The Fall: Peaceable Kingdom, Seekers: Point of Divergence(with Kevin Dilmore), From History�s Shadow, That Which Divides, In the Name of Honor, Open Secrets,and Paths of Disharmony.He lives in Kansas City, Missouri, with his wife and daughters.Kevin Dilmore has teamed with author Dayton Ward for fifteen years on novels, shorter fiction, and other writings within and outside the Star Trek universe. His short stories have appeared in anthologies including Native Landsby Crazy 8 Press. By day, Kevin works as a senior writer for Hallmark Cards in Kansas City, Missouri. In 2014, a short film written by Kevin, �Outside of Town,� was selected for screening in the Short Film Corner of the Cannes Film Festival. A graduate of the University of Kansas, Kevin lives in Overland Park, Kansas.